WAS THE BALFOUR DECLARATION A NEW IDEA? 1898 German Balfour-Like Declaration by Kaiser who wanted Jews to emigrate discussed with the Sultan who turned down the idea. 1903 British plan by Arthur Balfour (then PM) to resettle Jews in Kenya/ 6th Zionist Con ference approved the Plan. Failed but provided a precendent that the British were willing to provide transport and a home for the Zionists. 1917 British Balfour Declaration endorsed by major world powers and the Pope. The Balfour Declaration of 2 November 1917 is commonly regarded as a seminal moment in the history of Zionism, Palestine and the Middle East. The letter sent by A.J. Balfour, the British Secretary of State for Foreign Affairs, to Lord Rothschild, the Anglo-Jewish figurehead, stated that the British Government viewed with favour ‘the establishment in Palestine of a national home for the Jewish people’, and that it would ‘use its best endeavours to facilitate the achievement of this object’. Soon after, on 9 December 1917, British imperial forces captured Jerusalem. Ending just over four hundred years of Ottoman rule, Britain occupied the rest of the country by the end of the war, and was awarded the League of Nations Mandate for Palestine in 1920. Britain’s commitment to the establishment of a Jewish national home in the Holy Land became the basis of the terms of the Mandate, which was to last for almost three decades. During this formative period of colonial rule, the foundations of the Jewish State, and the Zionist-Palestinian conflict, were firmly established. The reasons behind the Declaration have been a matter of controversy ever since it was issued. At the time, British policy-makers were at pains to emphasise their sympathy for the plight of the Jewish people and their intention to restore the Jewish nation to its homeland. This supposed act of benevolence stemmed, it was claimed, from a longstanding tradition of British philosemitism and support for the Zionist cause. Although this myth has been of continuing influence, historians have tended to emphasise the political and diplomatic motives behind the Declaration. One reason for supporting Zionism was that it would help secure post-war British control of Palestine, which was strategically important as a buffer to Egypt and the Suez Canal. This was certainly the view held by some in favour of the Declaration, such as Prime Minister David Lloyd George. For others, their interest in Zionism had nothing to do with Britain’s strategic interests in the Middle East. Balfour did not even consider that Britain should control Palestine after the war, let alone use Zionism to that end. The single motive uniting all of the makers of the Declaration was the desire to harness Jewish support for the war effort, particularly in Russia and the USA. With the threat of revolution in the former and the need to ensure the full support of the latter, Jewish influence in these countries was thought to have been important for the British cause. Behind this policy were two erroneous assumptions. The first was the misconception that Jews held a powerful influence in Russia, the USA and elsewhere. The second was the belief that publicly advocating Zionism was the best way to curry Jewish favour. Despite the marked growth of the Zionist movement during the war, the majority of Jews were far from being committed Zionists. The idea that world Jewry wielded tremendous influence, as believed by Balfour, Lloyd George and others in the Government, derived from widespread antisemitic prejudice within the British Establishment. Similarly, the belief that the Jews were a nation in and of themselves came in part from antisemitic views of the Jews as a clannish people. Antisemitism was, however, only one part of the picture. The Balfour Declaration belonged to a wider phenomenon of British propaganda policies during the First World War towards ethnic groups, or ‘races’ as they were called at the time, particularly in the USA. These policies were driven by similar mistaken assumptions. The financial and material support of the United States was of critical significance for the European war effort, and as such it became the centre of the propaganda war between the Allies and the Central Powers. As part of this wider struggle, the British attempted to win the backing of a number of minority groups — in particular Poles, Jews and Irish — who were thought to wield influence in American society and politics. It was commonly felt by policy-makers that the promise of national freedom was the key to winning over the supposed power of these Diasporic communities. Indeed, such was the importance placed on Irish-American opinion, that it propelled efforts by Lloyd George to obtain — unsuccessfully — an agreement on one of the most controversial issues facing the British empire: Home Rule for Ireland. Seeking to capture the loyalty of the Arab world, the British also supported Arab nationalism, a policy which began in earnest with the infamous McMahon-Hussein correspondence of 1915 and 1916. Similarly, in the final year of the war, encouragement was given to movements for national self-determination in Central and Eastern Europe. In all these cases, ‘races’ were wrongly thought to be cohesive groups that could be inspired to support the Allies by an appeal to their nationalist identities. In reality, nationalism — whether Jewish, Arab, Polish or Irish — was not the all-consuming passion for these communities that it was thought to be in Whitehall. The Balfour Declaration was not, however, simply the by-product of mistaken perceptions in the British Government. These perceptions were turned into policy through the tireless efforts of Jewish activists. Faced with the many challenges of war, the British Government was reactive in its dealings with Zionism. Although their perceptions of Jews predisposed members of the Government to a pro-Zionist policy, they had to be persuaded and coaxed into action. From the end of 1915, a number of politically-engaged Jews successfully identified and manipulated the British Government’s misconceived pre-occupation with securing Jewish influence, eventually convincing the Government that a pro-Zionist agenda was the best means by which to do so. These individuals included Horace Kallen, an American academic; Lucien Wolf, the journalist and political lobbyist; Moses Gaster, the religious head of the British Sephardi community; Vladimir Jabotinsky, who was agitating for the creation of a Jewish Legion; and Chaim Weizmann, who, with Nahum Sokolow, was the official Zionist conduit with the Government from the beginning of 1917. In addition to these individual efforts, the leaders of the Zionist movement in the United States and Russia made a significant contribution to persuading British policy-makers by driving the expansion of the organisation. The growth of the Zionist movement in these countries provided important evidence for policy-makers, confirming their belief that Zionism was a popular cause throughout world Jewry. What was the result of all these efforts? 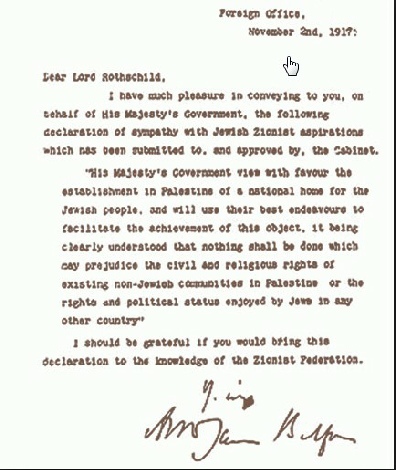 There are those who have argued that the Declaration was intended by the British Government to lead to nothing less than the creation of a Jewish state. In fact, there was no agreement by the Cabinet when the Declaration was approved regarding Britain’s post-war policy towards Zionism, nor were there any discussions as to how, exactly, the Government might ‘facilitate’ the ‘establishment in Palestine of a national home’. The primary concern of the Cabinet was not, after all, the future of Zionism and Palestine, but gaining Jewish backing for the Allies. By the war’s end, the future for Palestine, like much of the Middle East, remained unclear. Not only did its fate have to be agreed upon by the Great Powers, but the British themselves had not formulated a clear post-war Zionist policy. The great achievement of the Zionists was during this post-war period, when they managed to obtain the final terms of the Mandate. It was only then that the British became committed to secure — not to facilitate, as was stipulated in the Declaration — the establishment of the Jewish national home, to cooperate with a Jewish agency to that end, and to facilitate Jewish immigration and settlement on the land. It was on this basis that the Zionist movement was able to establish the foundations of what would eventually become the Jewish state. Balfour Declaration, (Nov. 2, 1917), statement of British support for “the establishment in Palestine of a national home for the Jewish people.” It was made in a letter from Arthur James Balfour, the British foreign secretary, to Lionel Walter Rothschild, 2nd Baron Rothschild (of Tring), a leader of British Jewry. Though the precise meaning of the correspondence has been disputed, its statements were generally contradictory to both the Sykes-Picot Agreement (a secret convention between Britain and France) and the Ḥusayn-McMahon correspondence (an exchange of letters between the British high commissioner in Egypt, Sir Henry McMahon, and Ḥusayn ibn ʿAlī, then emir of Mecca), which in turn contradicted one another (see Palestine, World War I and after). The Balfour Declaration, issued through the continued efforts of Chaim Weizmann and Nahum Sokolow, Zionist leaders in London, fell short of the expectations of the Zionists, who had asked for the reconstitution of Palestine as “the” Jewish national home. The declaration specifically stipulated that “nothing shall be done which may prejudice the civil and religious rights of existing non-Jewish communities in Palestine.” The document, however, said nothing of the political or national rights of these communities and did not refer to them by name. Nevertheless, the declaration aroused enthusiastic hopes among Zionists and seemed the fulfillment of the aims of the World Zionist Organization (see Zionism). The British government hoped that the declaration would rally Jewish opinion, especially in the United States, to the side of the Allied powers against the Central Powers during World War I (1914–18). They hoped also that the settlement in Palestine of a pro-British Jewish population might help to protect the approaches to the Suez Canal in neighbouring Egypt and thus ensure a vital communication route to British colonial possessions in India. The Balfour Declaration was endorsed by the principal Allied powers and was included in the British mandate over Palestine, formally approved by the newly created League of Nations on July 24, 1922. In May 1939 the British government altered its policy in a White Paper recommending a limit of 75,000 further immigrants and an end to immigration by 1944, unless the resident Palestinian Arabs of the region consented to further immigration. Zionists condemned the new policy, accusing Britain of favouring the Arabs. This point was made moot by the outbreak of World War II (1939–45) and the founding of the State of Israel in 1948. Was the Balfour Declaration a New Idea ?